If traveling between zones or if you’ll need a transfer, please let the driver know when paying your fare. Not sure which zone your stop is in? Visit our Zone Map or find the PDF for your route on our Schedules page and look for the Zone listed at the top of each column and printed on each route map. 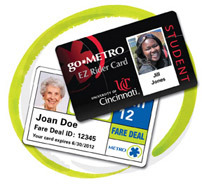 Fare Deal Card- Half-price fare card for riders who are 65 or older, have a Medicare Card, are disabled, and/or have an ACCESS Card. The Fare Deal monthly sticker is $38.50 (all zones). A Zone Check is your receipt for paying a higher fare. When you exit the bus at your destination, the driver will collect your Zone Check. If you do not have a Zone Check when exiting, the driver will charge the difference in fare between your starting and ending Zones. Please request your transfer when paying fare. Good on any route, any direction for 120 minutes. Good for up to two bus changes per transfer or until time expires.